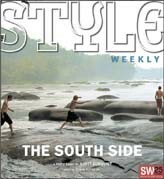 The South Side | Cover Story | Style Weekly - Richmond, VA local news, arts, and events. Editors' note: As part of Style Weekly's 25th anniversary, the editorial team is devoting special coverage to significant changes under way in the Richmond region. This occasional series through 2007 on housing, transportation and shifting demographics will explore the community's new directions, opportunities and challenges. South Richmond is special. Where it takes three city sectors -- East End, North Side and West End  to flesh out the city north of the river, the quadrant that is sometimes called "Dogtown" (and not always affectionately) comprises all of Richmond south of the James. While the river is difficult, if not impossible, to reach from the north, in most parts of the South Side the James is easily accessible. You can fish at Ancarrow's Landing, rock-hop near Belle Isle, swim upstream at the Pony Pasture or find one of many intimate wooded spots in which to sit back and watch the water roll by. The geography of the South Side is an easy read. Manchester, the oldest neighborhood, forms an elbow where the eastward-flowing river takes a sharp turn southward. Since the 18th century, Manchester's flatlands have been industrial. Cigarettes  Marlboro and Virginia Slims  and Reynolds Wrap aluminum foil have long been manufactured there. South Side's three defining roadways fan out from Manchester's elbow. Jefferson Davis Turnpike leads southward to Colonial Heights and Petersburg. Midlothian Turnpike, which once brought coal eastward from Chesterfield County mines, now leads outward to suburban shopping meccas and sprawling exurbia regions of Chesterfield and Powhatan counties. Semmes Avenue, following a former electric-streetcar route, extends westward from Manchester and morphs into Forest Hill Avenue to form a chain of distinctive, residential neighborhoods  Springhill, Woodland Heights and Forest Hill. The former railroad resort of Bon Air and the automobile suburbs of Westover Hills, Willow Oaks and Stratford Hills extend the chain. Along the grassy or jagged riverbanks, these neighborhoods are linked by Riverside Drive, the city's most breathtakingly beautiful thoroughfare. In contrast to its concentrated industry, South Richmond's quiet residential streets house 41 percent of the city's population. The area maintains a low-key posture, wedged as it is between jazzier activities across the river (at universities, government complexes, and cultural and sports venues) and the dramatically expanding population juggernaut of Chesterfield County. But South Richmond is gradually emerging from its historically understated aura. The warehouses of industrial Manchester are finding second acts as sought-after apartments, office spaces and artist studios. These mirror developments directly across Mayo Bridge in Shockoe Bottom and Tobacco Row. Manchester's long-frayed residential streets, which bear the names of War of 1812 heroes  Bainbridge, Decatur, Perry and Porter  are being restored with new and rehabbed housing. And who could have predicted that "Dogtown" (at least "Dogtown-extended," after the 1970 annexation of 23 square miles) would become a tony, regional shopping destination with the arrival of Stony Point Fashion Park?